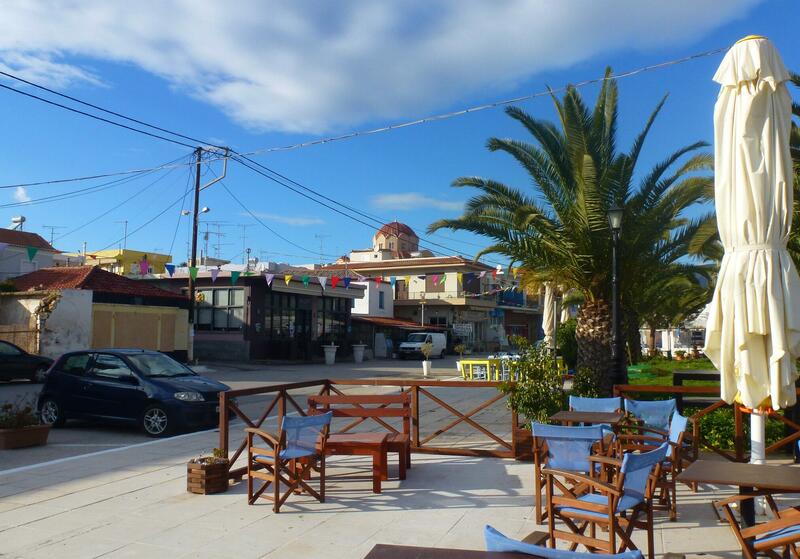 We were very happy with the site at Iria Beach. Whilst the area was a little run down and lacking in love with everything closed for the winter, the site itself was busy with 20 or so units and it was reasonably warm – once the snow melted both mornings. Our decision to move on was pretty much hastened by those creepy little caterpillar critters. Iain went and asked the owner what we should do with the first one, ‘not much really as they don’t bother anyone but you can kill it if you want’ was the response! Next day there was another one but on the next but one pitch. Our Austrian neighbour obviously feels a relationship with Arnie, he was out with a gas canister, a flame thrower and then torched the whole thing until it was just dust, that’s one that wont be bothering anyone again. The cotton wool ball like nests are pretty much everywhere right now so I guess its hard for the sites to deal with. After a third one was torched we decided we didn’t feel comfortable and we were a bit concerned at the advice that they ‘aren’t a problem’ when we know from reading up on them in Spain just how dangerous they can be. We packed up and within an hour were back to Triton II campsite, on arrival we did a double-check and the only nests were outside the site so we booked on for a couple of nights. On both Thursday and Friday mornings we woke to a white world, it may have only been a dusting but all the same it had snowed at sea level (the campsite owner told us it was the first snow since he had been there in 16 years). By mid morning the sun was warm enough to melt any signs of winter but the wind had an arctic feel to it. In the sun it was glorious, enough for a couple of days of sunbathing and we both have a good red glow now. Everywhere we go the main topic of conversation between motorhomers is the snow, our Norwegian neighbours were out doing mountain passes yesterday, they say it’s just like being at home for them – long drive though from Norway to Greece to feel like you are still at home! The campsite went from nearly empty to pretty much full in a few hours, it’s a Greek bank holiday called ‘Clean Monday’. We were a little worried when our next door neighbour strung up an outside light in the trees, luckily for us they do not party as hard, long or loud as the Italians and Spanish. 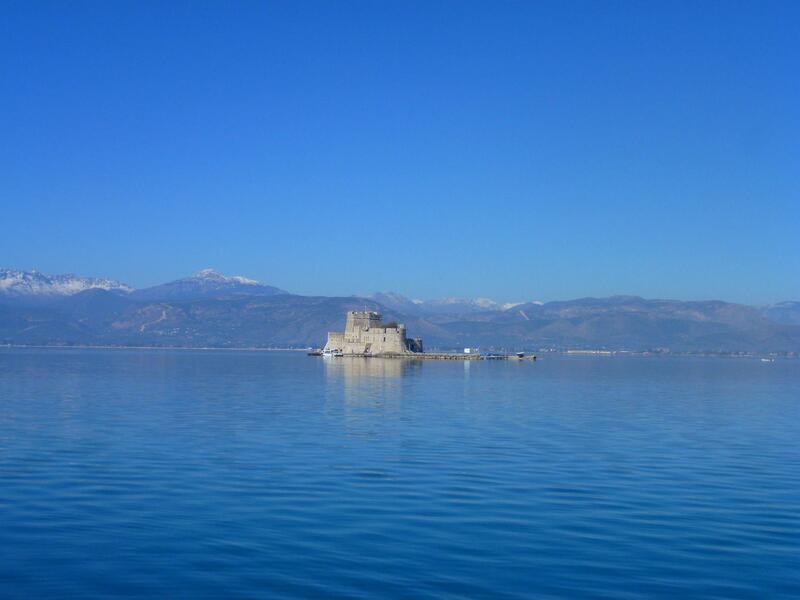 Saturday we decided it was time to go into Nafplio, we had resisted so far purely out of a mixture of laziness or being on our way somewhere else as we passed through. The sun was shinning so we dusted down the bikes and took a gentle cycle into town. The roads were quiet and easy to cycle on, plenty wide enough for a car and a bike and just 10 miles later we arrived in town. Wow, where did all these people appear from? It was so busy we had to push our bikes along the road into the centre as there wasn’t room to cycle. We later discovered everyone was there for the annual kite festival, we saw quite a few kites that looked a bit home made on the roadsides for sale but not a one in the air, maybe it was the wrong type of breeze? 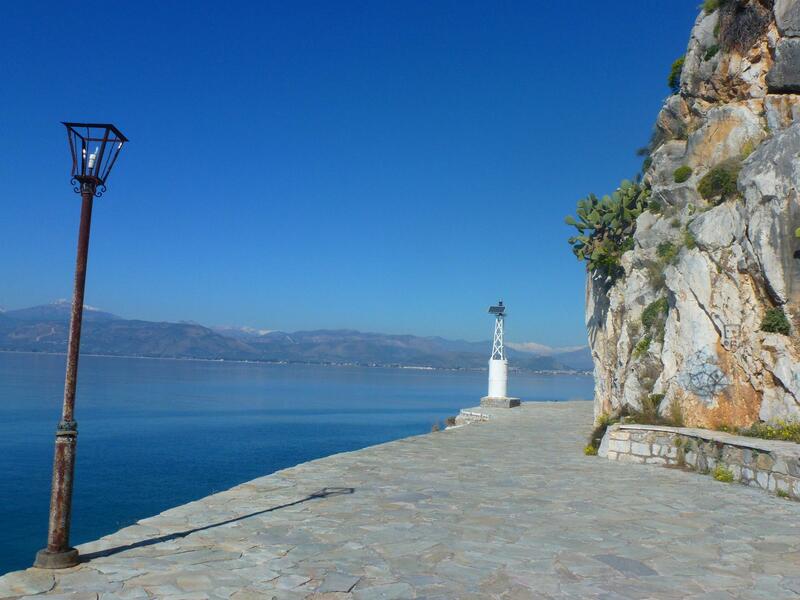 Nafplio is a lovely town, very trendy and cool, the sort of place you need the right handbag and sunglasses and then you can just see and be seen. People were busy doing nothing much except wandering along the promenades or sitting in the pavement cafes. The town itself is fairly posh and very lovely but the harbour area outdid it for us, it was incredibly beautiful. 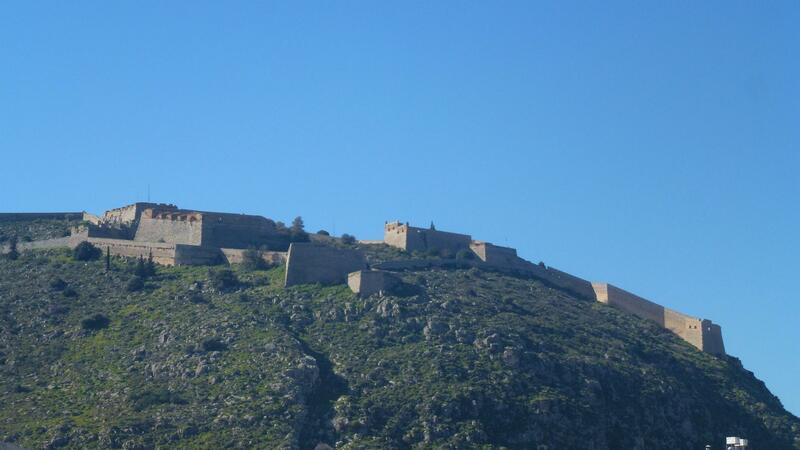 From there you can see the three castles that Nafplio can boast to owning. There is one on top of the hill on the edge of the old town, another mid way down just above town but the true star has to be the one plonked out in the harbour. Similar to the one we saw at Methoni that was some sort of jail it is quite simply a breath taking scene. 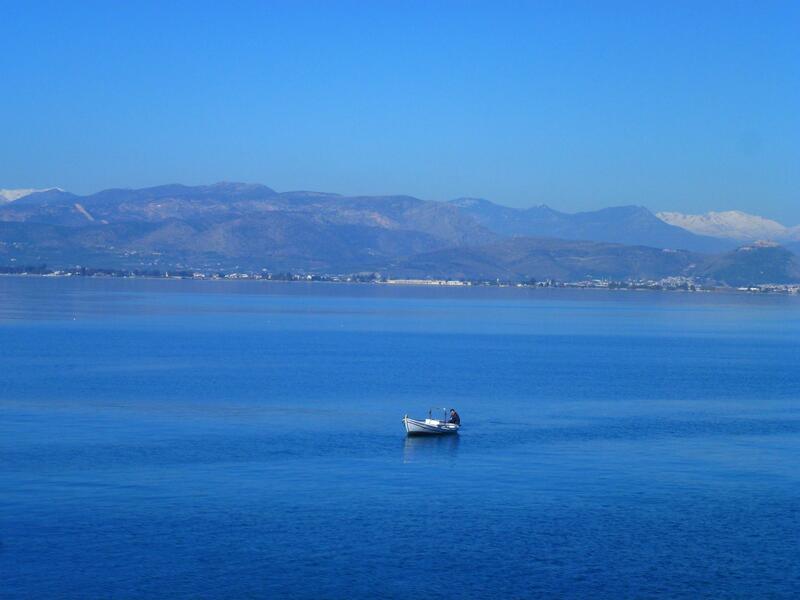 Nafplio was once the capital of Greece, it was pronounced as such by the first Greek Head of State following independence in 1829, for his trouble he was assassinated on the church steps in Nafplio just 18 months later by some very ungrateful independent Greeks. 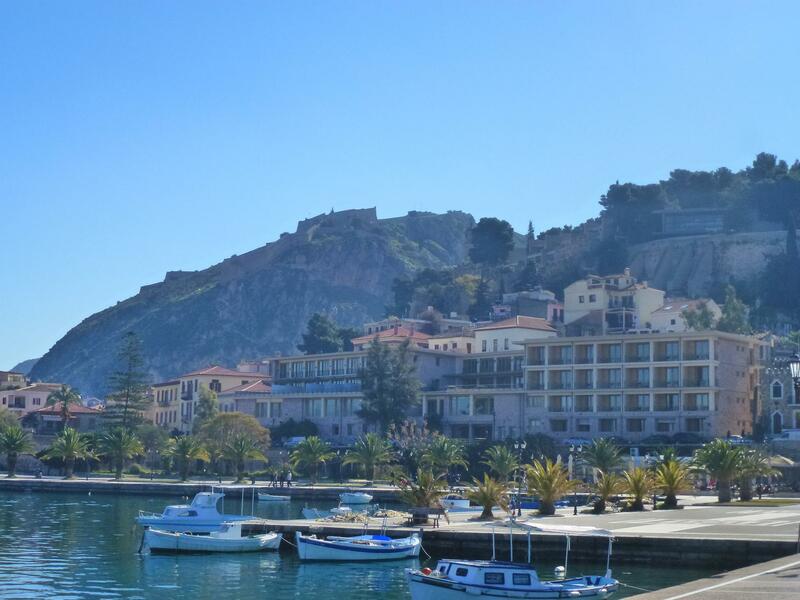 By 1834 the new king had decided Athens was going to be the capitals so Nafplio settled down to becoming a rather swish and stylish holiday resort that took off in the late 1960’s, predominantly for the Athenians who kept that coveted capital title. We cycled to the end of the harbour where there was a footpath around the cliff, the sign saying “no pedestrians” had been moved and anyway we were cyclists so we carried on. As we rounded the corner the path stretched out to the next bay, another postcard view. As we are in Greece there were fairly steep drops straight into the sea off the path, the Greeks are tough and don’t do handrails or really any type of safety. After a brief and confusing conversation with a Greek lady we understood we had to turn back as we couldn’t follow the path as far as we need to go. We crossed over to the other side of town and followed the road out of town looking for a good picnic spot, not the best route as the road doesn’t touch the coast and was fairly busy. As we dodged the cars we saw the Wanderlings chugging towards us, we waved – they didn’t. We gave up on the picnic spot and turned back to town which if anything it was busier, so it was time to head back towards Drepano. As we cycled along we saw the Wanderlings again, we waved – they drove off! Not wanting to labour a point but a couple of miles later we spotted a certain Dethleffs coming out of Carrefour – as we said ‘oh look who it is’ they were gone, again. The monastery of Metamorfosis Sotiros has intrigued since we were here last week, its so high on the hill you can only just see it. Out of our league in terms of climbing up there but I did try and research something about it on the internet, a little disappointed that the first thing I found was a web site where I could make an online donation! Looks like the Greek monasteries have well and truly embraced the powers of money making on the internet. Back at campsite after 21 miles we sunk down for a rest and noticed a calling card on our door. Yay! Roland and Claire were on the same site, an afternoon in the sun discussing the merits of various tourist attractions, campsites, feral dogs and snow. They assured us they hadn’t seen us on any of the occasions when they had passed us during the day. Well Claire said she saw a bloke in a yellow jacket on a bike waving at her but she couldn’t think why he kept waving so she ignored him, fair enough :). We left them this morning heading for the carnival in Tolo but we are fairly confident we will run into them again over the next few weeks, hope so as it’s always lovely to see them. 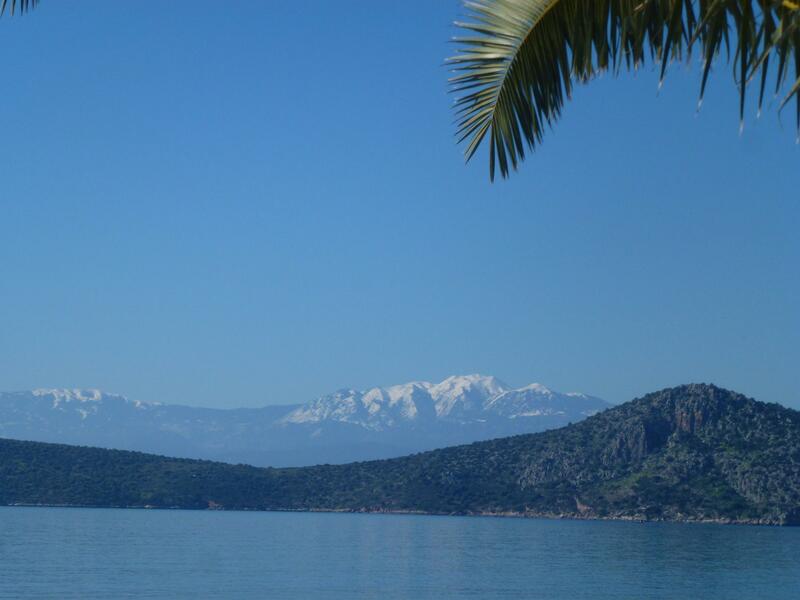 At long last we have made the move and off, well nearly off, the Peloponnese. We took the main road directly North, a very quiet run up with some glorious views over to the mountains. 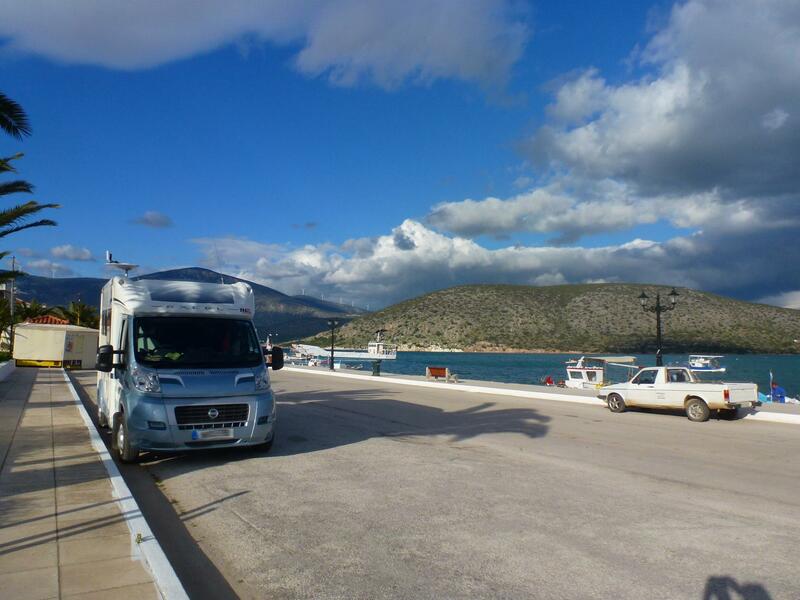 We are stopped at the Camperstop Aphrodite just a few miles before the Corinth Canal. As we approached we passed the entrance to Ancient Corinth, we had said no more ruins for a few weeks but it looks fairly interesting so will head back there in the morning before having a look at the famous canal. This is our kind of Camperstop, it does what it says on the tin, there is everything you could need for €10 (well we hope it is because we forgot to confirm the price). The owner is a wonderful gentleman who explained everything in a mixture of Greek, French and English with the biggest smile you could wish for. By the time we had parked up and plugged in he was back with a tray containing complimentary bowls of currants soaked in honey and a couple of glasses of water. The site is a work in progress but then so is a lot of Greece! Our plan now is to get a real plan and stick to it a bit more, so we will be here a couple of days then head onto mainland Greece. The new / real plan is now bypassing Athens (too busy), probably seeing Delphi (it’s been highly recommended) then out to Volos (another break on the beach). A quick stop at Meteor (top of our must see list) and then we will then be driving East and stopping just before Turkey (Iain has vetoed Turkey) and crossing the border into Bulgaria, from where its North all the way to Finland. This is all subject to no better plans coming up in the meantime but we are pretty confident its the way to go. We have spent days checking out on the internet what there is to see on the South East side of the Peloponnse, the guides books seem to miss out an awful lot that you may or may not come across just by chance. The passes around Mt Didimo were worth the trip in themselves, full of sunshine and spring flowers and offering up wonderful views over the valleys down to the coast. The roads were wide enough to enjoy the twisting and turning hairpins but the lack of armaco on many of the higher roads does cause more than a few heart stopping moments, more so when you are the one on the side hanging close to the edge. Looking on the map we saw Big Cave and Small Cave both marked at the town of Didima, not too far off our route South so we diverted off for a look. Once in the village there is a sign pointing up a fairly unmade road, we followed it to the bitter end, and there is nowhere at all to turn around even a 6 metre motorhome. Well there is but Mr Olive Farmer had his tractor and trailer parked there. After watching us struggle he finally offered to move but only after all the olive branches he had been pruning had been picked up and put in his trailer. The speed he was going it was going to take the rest of the day so I took his slowness to mean he could do with a hand and helped clear the branches whilst he went in search of his keys. Eventually he moved his tractor (that was built when Adam was a lad) and we moved the van back down the lane. After all that effort Big Cave was probably the least impressive, its more like a massive cavern and it can be seen from the main road. To go and explore further would have meant wandering across Mr Olive Farmers land again so we skipped that one. 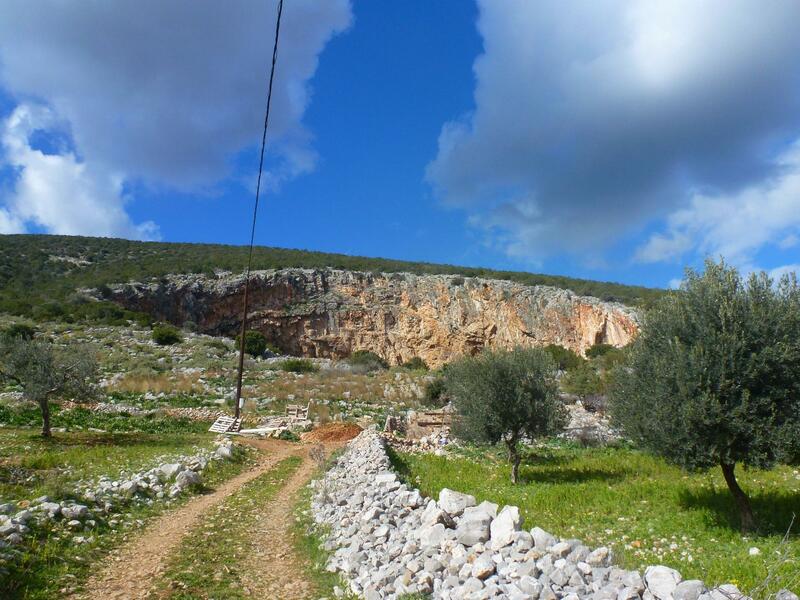 Big cave – with nowhere to turn around a motorhome! 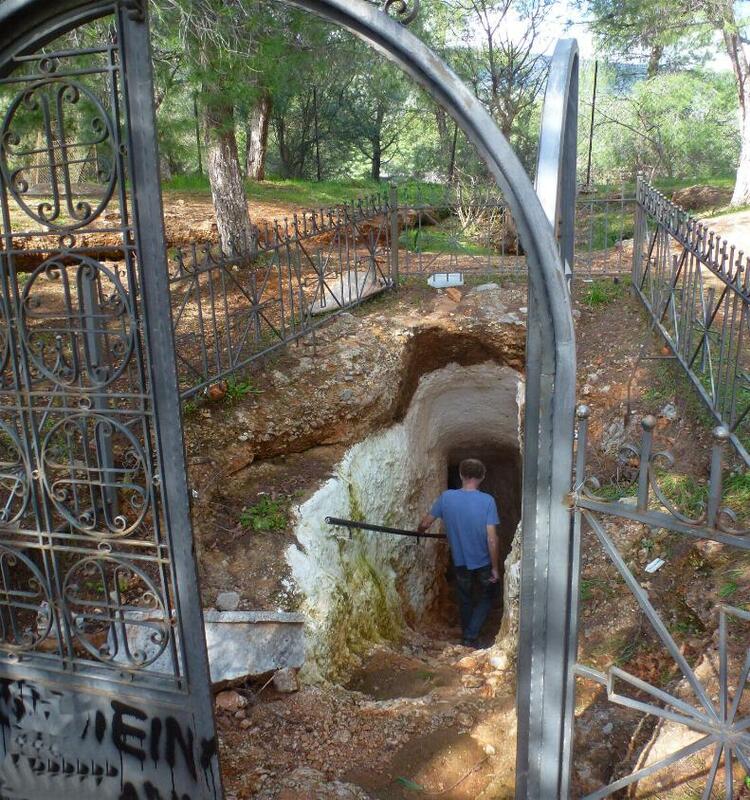 Small Cave on the other hand is amazing, there are two small metal gates which you enter, it looks like walking into a grave. 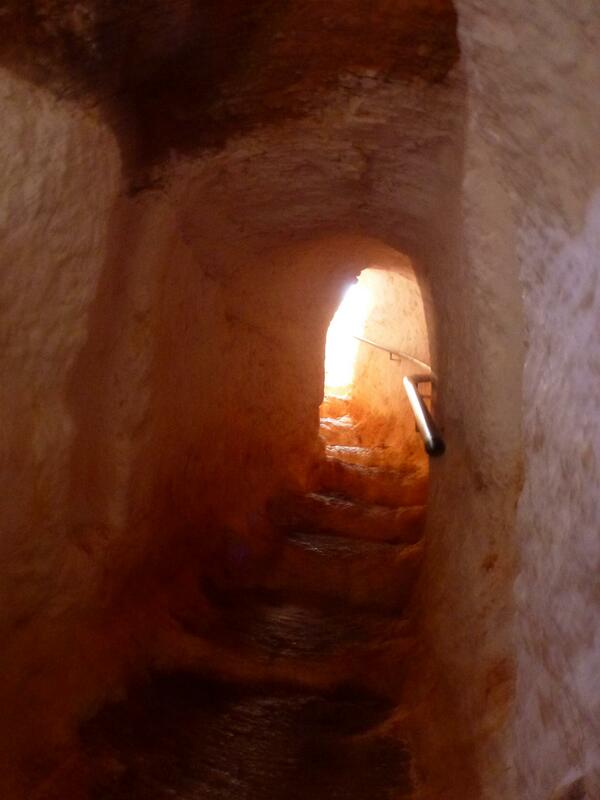 Then we followed the steps carved into the rock which took us through a tunnel / passage which leads through to the inside of Small Cave. It isn’t what I would expect of a cave, its more like a massive sink hole or cavern, once you have gotten through the rock then above you is clear sky. Climbing down the steps there is a balcony and from which you overlook both the cave and the two small Byzantine Chapels. 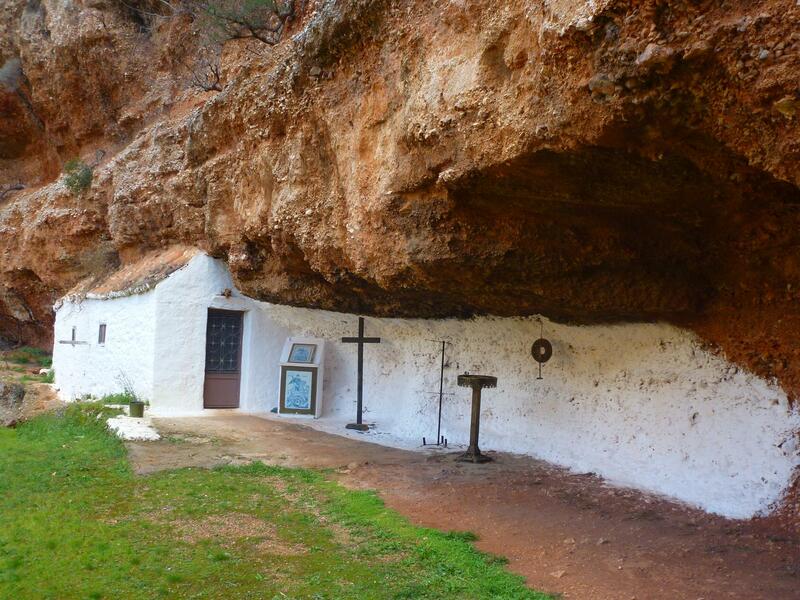 A small path runs around the cave linking the two churches which are one on each side, Aghios Georgios (St George) which has wall murals dating back to the 13th century and the church Metamorfosis of Sortiros which is built into the rock. Both churches were unlocked and contained plenty of religious icons and lit candles and yet there wasn’t a soul around. It is truly a magical place, just the entrance through the side of the rocks makes it special and yet it is not mentioned on an tourist literature we have found anywhere, if you are ever near Kranidi then it is a must to see, trust us, its truly unlike anywhere else we have ever seen or heard of. We spent the night at Kilada, a very busy fishing port with hundreds of small fishing boats, pleasure cruisers and even a few that Mr. Cowell might be seen using. We parked up out of the way on the promenade, not as out of the way as we should have as the small kiosk selling cigarettes and newspapers must be the busiest in Greece, a roaring trade of cars coming and going until the early hours. Over in the cafe at the other side of the road the sound of accordions drifted over, it was going to be a very quiet and peaceful night. Then the wind got up a little and we must have had some olive branches on the roof which flicked around all night scratching and rattling. Just after 2 am I awoke to Iain climbing out through the small sunroof, just a pair of legs dangling through a 2ft square gap whilst he tried to reach the said branches. It scared the life out of me for a few minutes as I thought it was someone coming in, well it was but I didn’t think it would be Iain. After all that he couldn’t move whatever it was so resorted to ear-plugs and went to sleep. Moving back up the other side of the coast we passed through what are known as the island towns, some are linked by causeways and some are true islands. Most of the towns appear quite similar with whitewashed houses and red roofs squashed in together at the bottom on a hill, next to a harbour. 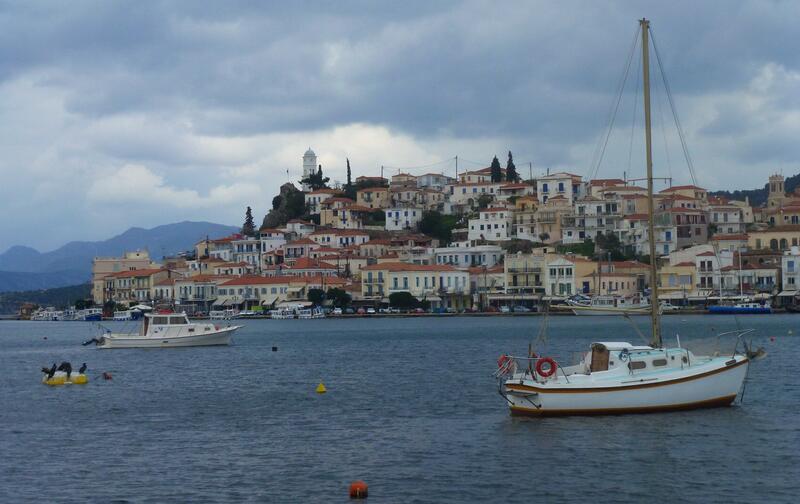 For us the most attractive was Poros, seen from the mainland village of Galatas. To be fair though as Iain pointed out if we had been to Poros and looked the other way then Galatas would probably have looked just as good. 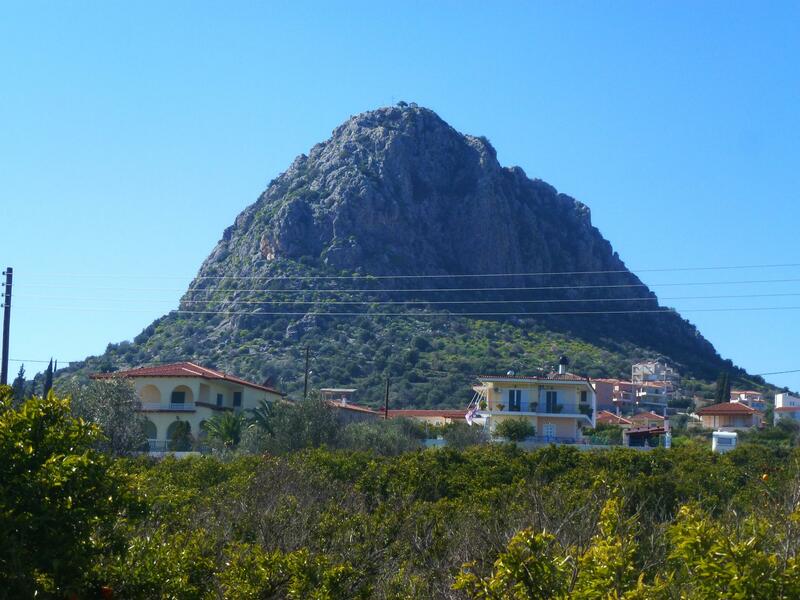 From Portoxeli around to Ermioni we saw more signs of 1960-1970’s tourism than anywhere else on the Peloponnese in terms of bigger hotels built with no thought other than pack ’em in high in a square box with a balcony. By no means is it as overdone as some areas in the Med but seemed so out of place as we haven’t seen many at all in the whole of the region. A good number of them now stand empty and look as if they have for a few years and some are slowly falling down of their own accord, not a bad thing. 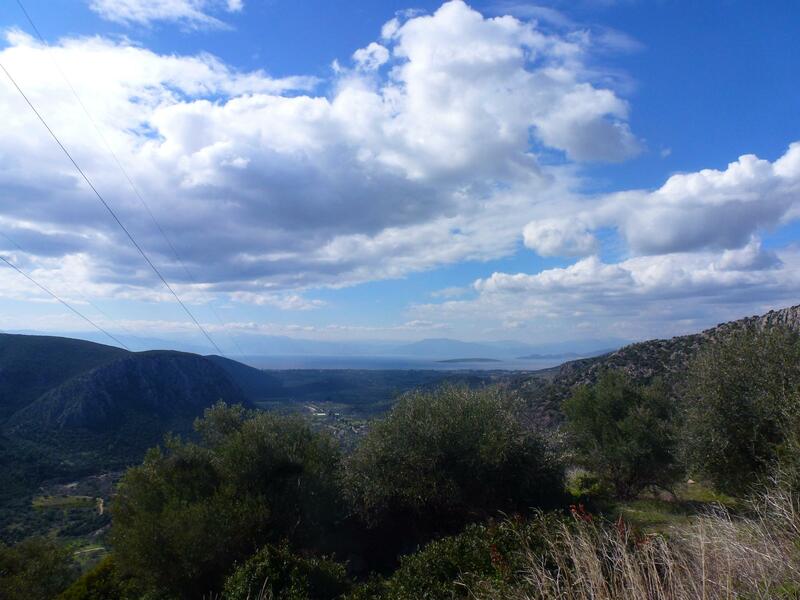 We took the causeway over to Methana, almost an island with the weirdest causeway that climbs high over a mountain then dips straight down the other side. Right at the top was a very photogenic white and blue church, freshly white washed for the summer trade we did stop for yet another church photo, it was too lovely not to. A few miles along is the biggest town on the nearly-island being Methana. Iain loved it, I was a bit undecided. Some of the hotels were very 1970 and yet some were clearly much older and built with a thought as to how they looked from the outside. The main street was quiet but immaculately clean, a chap wandering along on his moped with a bin-bag picking up any rubbish as he went. The two cafes were busy with the usual worry bead conventions but other than that it was eerily quiet. We parked up just off the harbour, hidden away from the mains street behind a small park. We were joined by a dozen feral cats and a couple of hungry stray dogs and spent a very quiet night. As we head back along the coast in the morning we came across a nature reserve of some sort, pink flamingos by the road side and several bird hides. We pulled in and got our binoculars out ready for a bit of spotting, as we climbed out of the van it started snowing. We were at sea level, Roland and Claire were miles away so where was the snow coming from? We gave up with birding as it was way too cold and decided to head for campsite back over at Iria. Firstly we needed to continue up the coast and a real stunner of a road carved into the side of the cliff. Then we started up the mountain, thought better of it, turned at the first junction and went across country. As we headed round the mountains we decided time to stop at one of the many, many bakers. They seems as frequent as the garages and most actually bake themselves rather than have stuff delivered in. 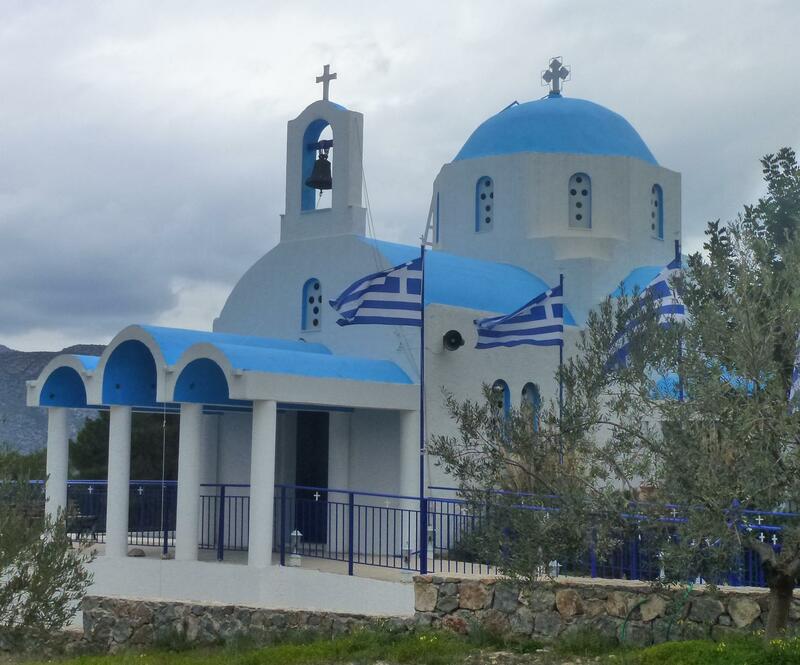 We treated ourselves to traditional Greek cheese pies and some very stodgy cream cakes. The lovely lady baker insisted on a tour around her bakery, including the back room containing the massive bread ovens and the tower of ovens containing cakes just baking. We are now set up at Camping Iria for a night or two whilst we plan our next few days. We are a little out in the sticks but its very flat where we are, that seems a good enough reason to stay and take the bikes down for an airing. By lunchtime today the sun was back and any signs of snow were well and truly gone. Its been a a very pleasant afternoon, becoming warmer by the hour. The campsite is fairly busy, mainly Austrians but a Dutch de-mountable pulled on just after us. We have a lovely big pitch in the middle of the site away from the trees. 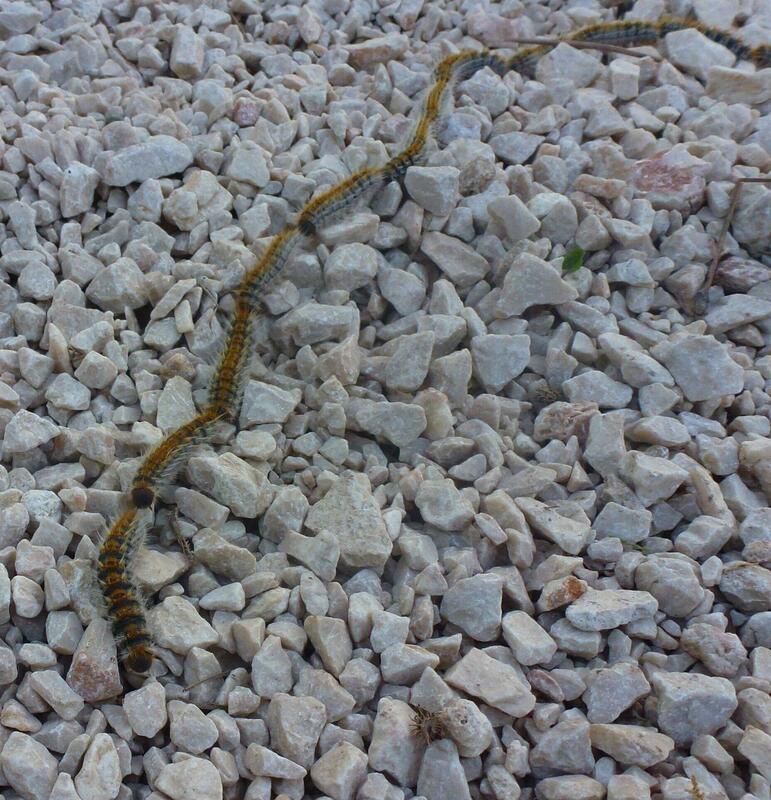 Despite that I spotted this these little critters at tea-time, our first Processionary Caterpillars, Iain was dispatched to remove them as that job comes under Logistics for sure.